Campari Bitter Gaspare Campari created this bittersweet red aperitif, flavoured with 68 herbs and spices, between 1860 and 1867 in the cellars of his Caffè Campari coffee shop in Milan. The new drink became locally famous when he moved his business to the newly built Galleria Vittorio Emanuele in September 1867. Product #: 190 5.0 stars, based on 1 reviews Rating from 1.0 to 5 £17.25 In stock! Order now! 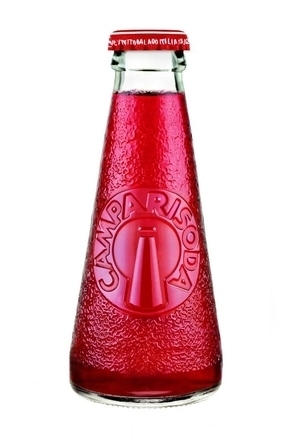 Gaspare Campari created this bittersweet red aperitif, flavoured with 68 herbs and spices, between 1860 and 1867 in the cellars of his Caffè Campari coffee shop in Milan. The new drink became locally famous when he moved his business to the newly built Galleria Vittorio Emanuele in September 1867. Campari should be served chilled and the bottle must be kept from direct sunlight and heat, ideally in a refrigerator. When serving with a mixer, the drink should contain 50/50 with the mixer (such as tonic, soda or grapefruit juice). When adding a garnish to a drink containing Campari, always use a slice of orange, as lemon or lime impairs the true flavour. Aged blood orange peel, orange sherbet, ruby red grapefruit zest, quinine, bayleaf, cherry, lemon thyme and herbal woodyness. Heady peppery spirit tingle. Herbaceous quinine bitterness balanced with syrupy sweetness flavoured with blood orange zest, mint, cherry and honey. Long lingering quinine, zesty orange and orange pith bitterness. Fades with quinine, orange zest and clove. Bittersweet with syrupy sweetness offset by bitter quinine, zesty orange, orange sherbet, orange pith bitterness and tart grapefruit. Those may not sound like deliciously appealing tasting notes, but in it's own bitter and orange twisted way Campari is delicious - certainly for those of us who have acquired a taste for it.